Located in the area of Paguera and Costa de la Calma few kilometers from Santa Ponsa, and about 20km from the city of Palma. 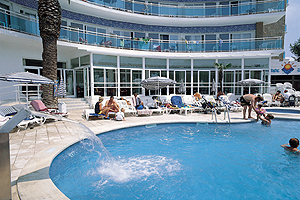 The hotel has two outdoor swimming pools with sun terrace and a snack bar, wellness and Spa center, fitness room overlooking the sea and two restaurants. Buffet breakfast with sparkling wine. Active guests will appreciate the hotel’s 5 tennis courts, as well as the many golf courses in the surrounding areas. The wellness and spa center consists of steam bath, Finnish sauna, heated indoor swimming pool and whirlpool, as well as 6 treatment rooms. The gym, indoor pool and saunas is of free use by the hotel's guests. 24 hours front desk service, copying and fax service, dry cleaning and laundry and free wireless LAN in various areas of the hotel. Complimentary shuttle bus service to Paguera beach is provided by the hotel.